A Book Advent Calendar is a great way to get into the Christmas mood and spend real quality time with your child doing something they'll remember forever. Forget chocolates and windows, your child can open their imagination every day in the run up to Christmas. Scholastic have put together 2 fantastic bundles of 24 books for advent 2017 and I'm truly delighted to be able to give away one of each. 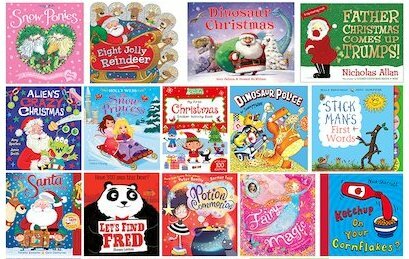 If you bought all of these books individually then they'd cost over £145rrp, but Scholastic are giving everyone an early Christmas gift and this Advent Pack of 24 books for age 0-7 is available to buy for only £29.99 while stocks last. 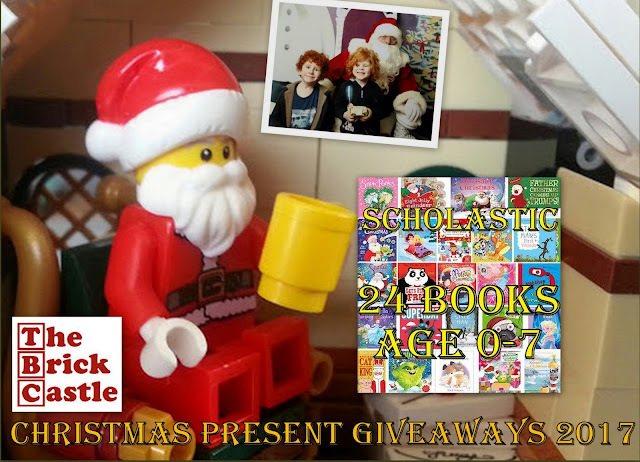 Scholastic Books are responsible for my earliest memories of loving books, I waited for the Scholastic Books leaflet each term with a great deal of excitement as I was allowed to choose a brand new book for myself. It gives me great joy to be working with Scholastic on such an awesome Christmas giveaway. Included in the 0-7 bundle are books by some excellent authors including Nick Sharratt, Julia Donaldson and Mick Inkpen, and it actually includes 2 of my all-time favourite Children's books - Kipper's Christmas Eve and Stick Man. This giveaway features short stories and picture books for you to read with young children who aren't yet confident reading by themselves. I also have another Advent Bundle Giveaway for older, independent readers - Young Fiction for children aged around 7+. Advent Bundles aren't Scholastics only book packs - we've written before about the Laugh Out Loud Awards (vote until Dec 8th) and Scholastic have a pack of all 12 Laugh Out Loud Awards (Lollies) finalists for only £24.99 - saving a massive £55 over the rrp. Scholastic offer all books at discounted prices, and termly book brochures for schools (each sale from those brochures raises money for your school). 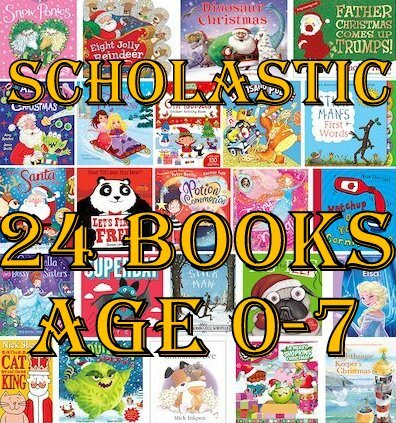 You can find out more about all of Scholastic's products and order the 24 book Advent Pack of books for age 0-7 on the Scholastic Website. For your chance to win the amazing 24 book Advent Bundle for age 0-7, enter using the Rafflecopter form below. Scholastic Books have asked that entrants sign up to their newsletter, so the first and only mandatory entry is to leave your email. It won't be used for anything else or passed on to any 3rd party and you can unsubscribe at any time. Entry to the giveaway is open to UK entrants only and will close at midnight Sunday 26th November so that you can receive your books in time for the beginning of advent - the winner will need to get back to me as quickly as possible though! Full terms and conditions are on the Rafflecopter form. I've been reimbursed for some of the time taken to administer this giveaway. Oh yes I remember getting those leaflets too and pouring over them excitedly! I loved reading as a child and would read with a torch under my duvet every night! I have always loved reading and getting lost in books - my earliest memories of having bed time stories read to me by my mum and man when I was little! I remember having a shelf full of ladybird and Mr Men books in my bedroom when I was younger and loved reading them over and over! I loved my books and started reading Catherine Cookson at a very young age. Then at 13 I moved on to James Herbert and Stephen King!! My favourite memory is reading the twits in one sitting when I was nine years old, I absolutely loved it and couldn't put it down. I had a bedtime story book my grandma bought me for Christmas, it was a page a day, and some of them followed on the next day, I loved finding out what happened to everyone, and remember it clearly 50 years on. I read a lot as a child and still do as an adult. I remember my mum reading a book about a rabbit to me and it came with a rabbit puppet so she acted out the story with the puppet, it was lovely...I still have both the book and the puppet now, 30 odd yrs later. I remember my mum giving me my first book, Tiptoes The Mischievous Kitten by Noel Barr. Still have 2 of them from 1976!! When I was at primary school and the headmaster used to read to us. Everything from poetry to The Hobbit. I loved it. I was a passionate reader as a child and my favourite place was our local library, I have such fond memories of spending hours there throughout my childhood. I loved Beatrix Potter books especially the tale of Peter rabbit, I still have my box set full of miniature books that I read to my daughter, I remember I used to picture the stories. My earliest memory is reading Enid Blyton's Naughty Amelia Jane. I remember my father coming home from a trip to Moscow with a book of Russian fairy tales (in English), which was full of stories of dark woods, wolves and witches and had the most beautiful illustrations, unlike anything I'd seen before. My granddad reading us stories and making up voices with his big booming voice. I have always loved books, I think my earliest reading memory is reading Spot the Dog! My fondest memory isn't that early, but I remember receiving Ballet Shoes as a child,it is still a fav of mine. world book day when you got your £1 voucher to get a book and all those bookgroup leaflets! I remember having a whole bookcase full of books that I love to explore! My favourite books for a long time were those by Enid Blyton, particularly the Famous Five. EJ Dunn. I remember my mum reading me Peter Rabbit Books before bed. When I was at middle school we had Michael Rosen come in one day to read We're going on a bear hunt' with us, it was fab! I remember having a book which I think was called The Windy Day about a rabbit family, it had lovely illustrations and was always my fav! I was the 3rd of 4 children, and my Mum would read to each of us before we went to sleep. I always remember sitting on my younger brother's bed to hear his story before mine, with my older brother and sister sitting on my bed. I was always jealous because my sister got to listen to 4 stories every night! Sat on dining chairs on the living room of our new house as we were moving in, and resting my head in my Mum’s lap, who was pregnant with my brother at the time, as she read me a story. I must’ve been 4 at the time. I adored reading as a child by the time I was 8 I had read most of the classics and I still love reading today. The Magic Faraway Tree books read to me by my mum - then reading famous five books by myself under the duvet with a torch. My boys are exactly the same now! I loved curling up in bed reading a book with a torch!! We were lucky enough to have a library at the bottom of our road when I was growing up, originally a moot hall set in parkland. I remember the uneven wooden parquet flooring, leaded light windows, sturdy wooden bookcases, and queuing up to get the books stamped with the return date (no barcode scanners then). I loved that place, and to me that will always be what a good library should look and feel like. My earliest reading memory is when we used to live next door to my primary school teacher, she had me come over to her house to read to her husband as she said he wouldn't be able to believe how well I could read for my age. I can recall reading Fairy Tales books, and Enid Blyton books as a child. i loved reading as a child and spent most of my spare time reading. I still love it now but unfortunately dont have as much time. I have a early memory of when i was about 5 learning to read at school. I always loved reading. Remember bring 5-6 and going with my mum to a book shop and buying a book with my first pocket money. Sadly the book got lost in the process of moving houses. I had a super memory when I was a child. I was the youngest child of a group of us at my child minders. Even though I couldn't read, the other children would sit around me whilst I read to them. I'd memorised the words and knew exactly when to turn the pages and all the older children believed I was actually reading and would always ask for story time. I always remember reading The cat in the hat for some reason. I always had a book. I took one everywhere, “read me a book” was one of my first sentences. I was an early reader and I have a vivid memory of the first time I read a book in my head. I was 5 and it was The Children of Cherry Tree Farm by Enid Blyton whilst sat at the dining table, completely lost in the story. I remember as a child wanting my mum to read The Very Hungry Catapillar every single night! She must have been sick to death of it! Roger Red Hat books at school! To be honest my parents did not buy me book or read to me. So I make sure my kids have LOTS of books now. Reading MEG & MOG books! I always had lots of books for Christmas and birthdays, and loved them all! I remember reading favourites like My Cat Likes to Hide in Boxes with my mum. Now I read it with my daughter. We had a library just a 10 minute walk away and my mum would take me there all the time as a child. As I got older I would go there by myself and spend all afternoon sat reading adventure books. I won an illustrated book of Biblical tales for attendance at Sunday School, loved it at the time and still have it! Enid Blyton collection - I used to read so much as a child! I used to love reading as a child! I loved the Faraway Tree books by Enid Blyton as a kid. They were full of magical creatures and wonderful adventures. I remember being obsessed with the sweet valley high twins and was always waiting for the next book to come out! I remember The Very Hungry Caterpillar from infant school. I loved getting books,especially at Christmas,and would read secretly under the bedcovers(with a torch! )when I should have been asleep. I remember our reading corner in our classroom in my first year at primary school. We had lots of Ladybird books, including Three Billy Goats Gruff which I loved the most. Remember reading 'Meg the Hen' with my mam. Reading every single Enid Blyton book that I could get my hands on. My dad taking me at Christmas (I was 5 or 6) to choose my own book. It became an annual tradition. I remember my mum reading to me every night and it was our mother daughter time, we'd make up silly voices or add to stories. I do this with my son now and were in fits of giggles most nights.